At last. The full story of the Long-eared Owls nesting in our yard in 2015. This is a joint post with Christian Artuso, who came over several times to photograph the owls. Many of these photos are his and are used with permission. 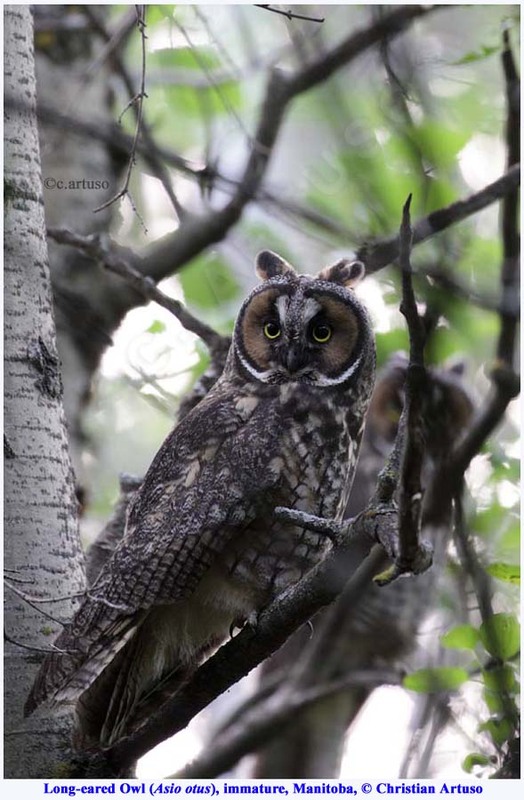 In the Spring of 2014 we were pleasantly surprised by a pair of Long-eared Owls that showed up, right in our backyard! We discovered them mid-April, and they stuck around for a month or so, right in our yard, but they disappeared and we didn’t see them after that. I suppose they spent the spring in our yard, but didn’t nest here. This year, 2015, in late March we again discovered them, right in our back yard. 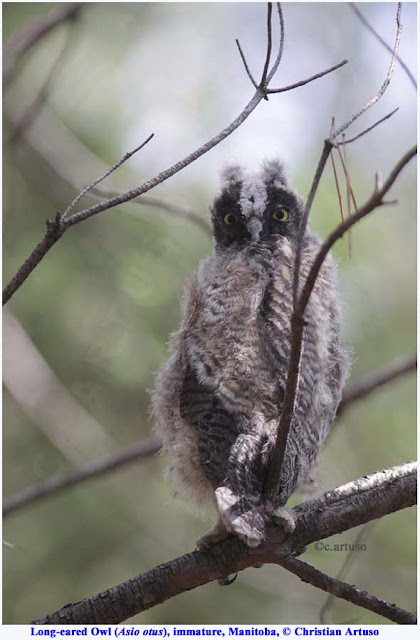 In a month or two, we discovered a nest, in the back forest, with three white, fluffy owlets! 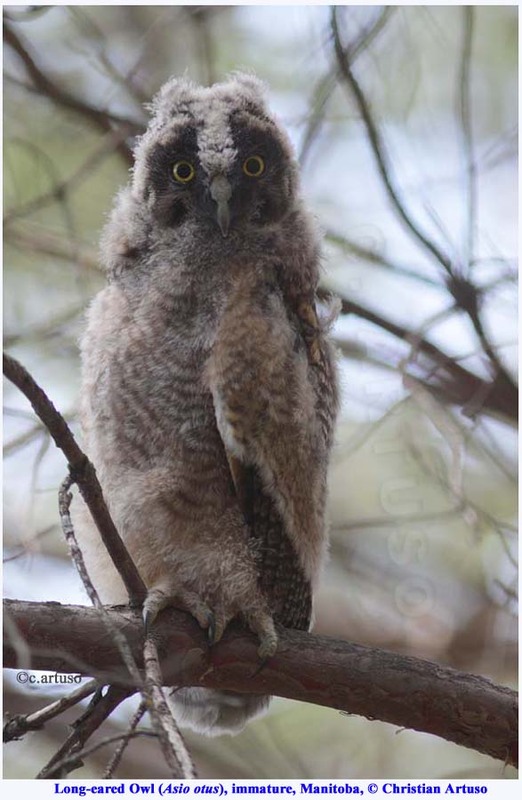 The next day we found a dead owlet beneath the nest, perhaps there was only two left. It wasn’t until a bit later that we found that there were still three left, so it the beginning there was four. 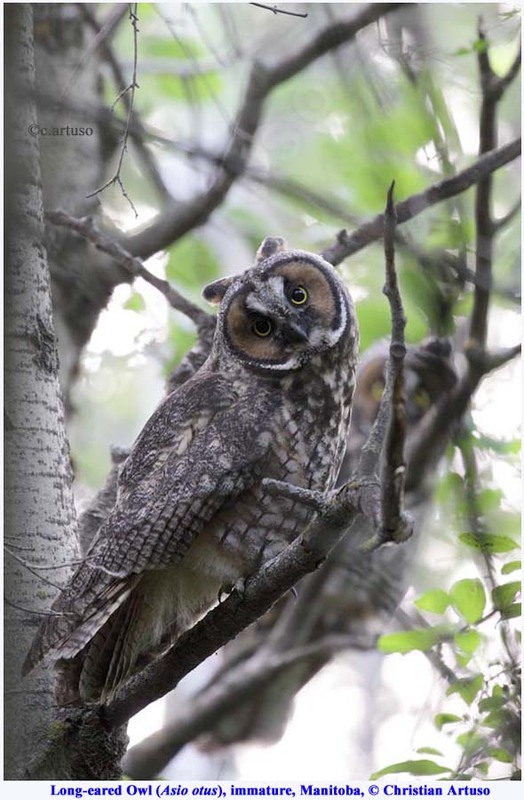 By the beginning of June, the owlets were branching. 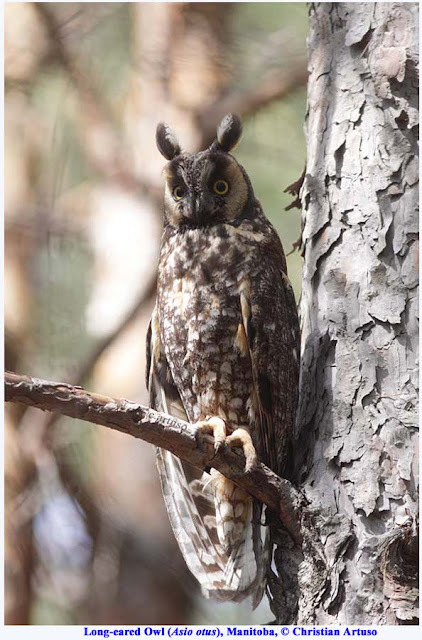 This means they are hopping from branch to branch, and flapping their wings, the first step towards flight. 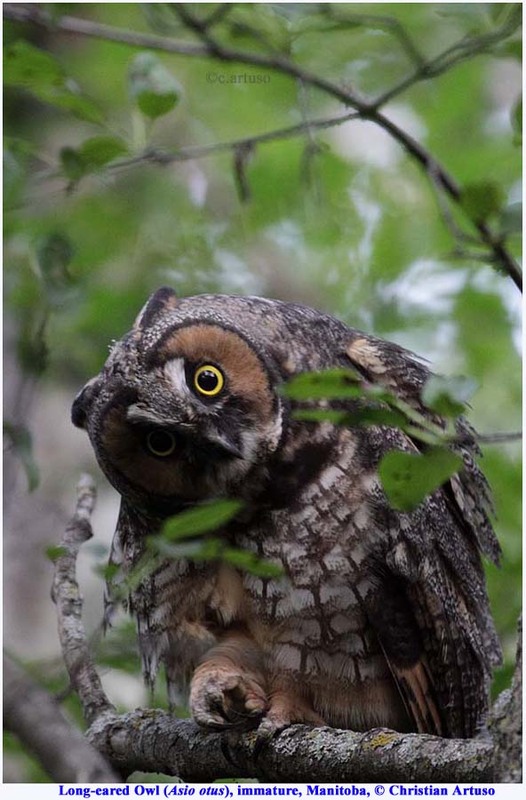 In the day the young owls would sit in the trees, quite low to the ground, which was ideal for photos. They quickly grew up and would beg for food endlessly. Soon they were okay at flying (though still very noisy). Christian came over several times to photograph them. On March 21st we first found the Long-eared Owls this year, there was still snow on the ground. 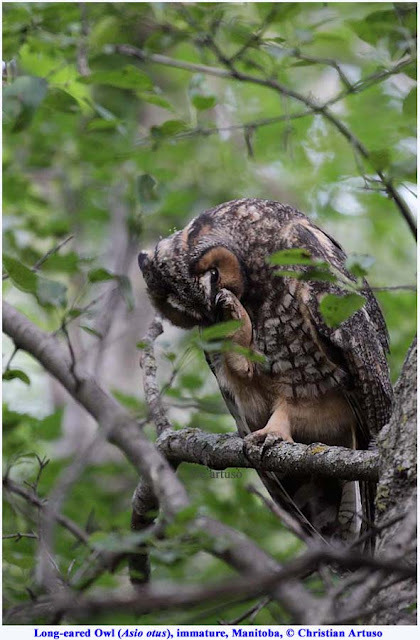 It was very exciting to have the owls again, two years in a row. 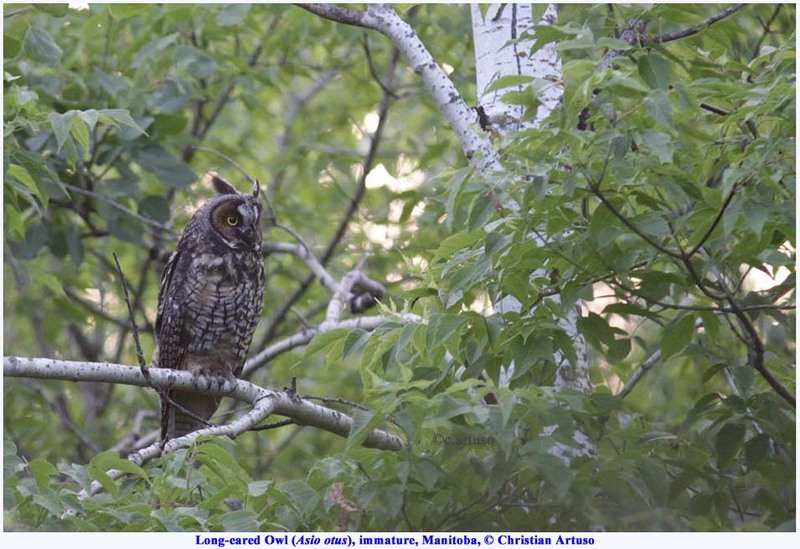 May 26th William saw three owlets in a nest. The nest was in the back spruce forest, just off of our property, on the neighbors. We later discovered the nest was only about 10 meters away from the Cooper's Hawk nest. 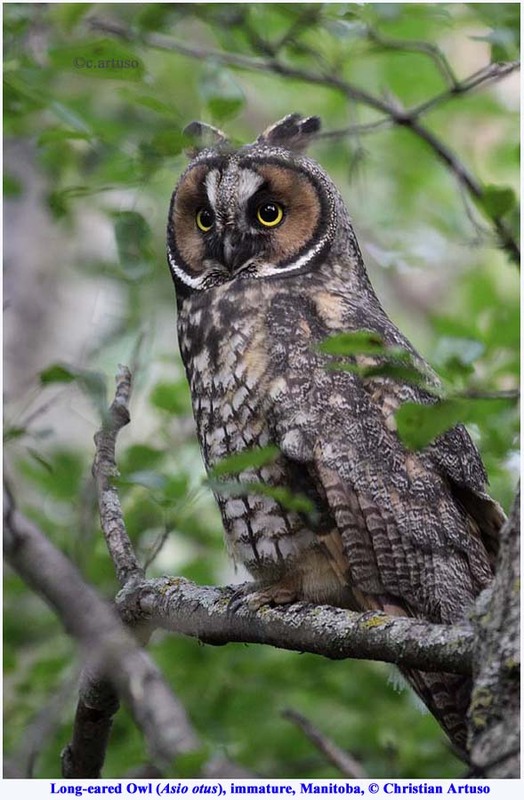 It is quite satisfying to enter 5 Long-eared Owls on eBird. Soon the owls were branching, and then we had excellent opportunities for photography. Of course we still had to be very careful to watch them for any signs of disturbance and to make sure that their body posture was still relaxed. Once while we were taking pictures of a young owl with Christian, we didn't even notice an adult owl which was several feet away from us. They are masters of disguise, blending in with the tree trunks. We had to back away very slowly. We walked around the spruce trees, locating the different fledglings. As time went on, their flight feathers began to really show, and we saw them flapping their wings, and jumping from branch to branch. At this time, the three grey fledglings stayed around a particular row of pine trees. They stayed around that small area for quite a while. I like to call this area Zone 2, and the nest area Zone 1. 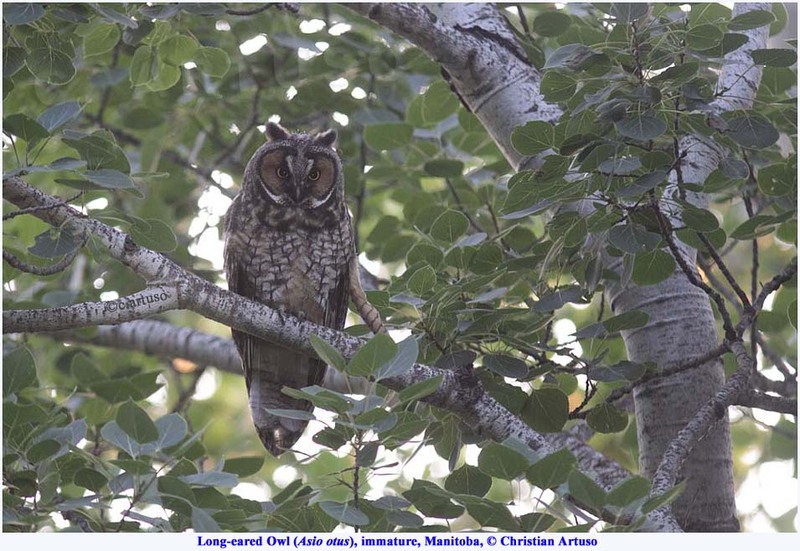 When they were very young, they stayed around Zone 1, in the Spruce forest, when they were a bit older, they stayed around Zone 2, and for the rest of the time they were here, Zone 3, which was mixed deciduous forest closer to our house.. 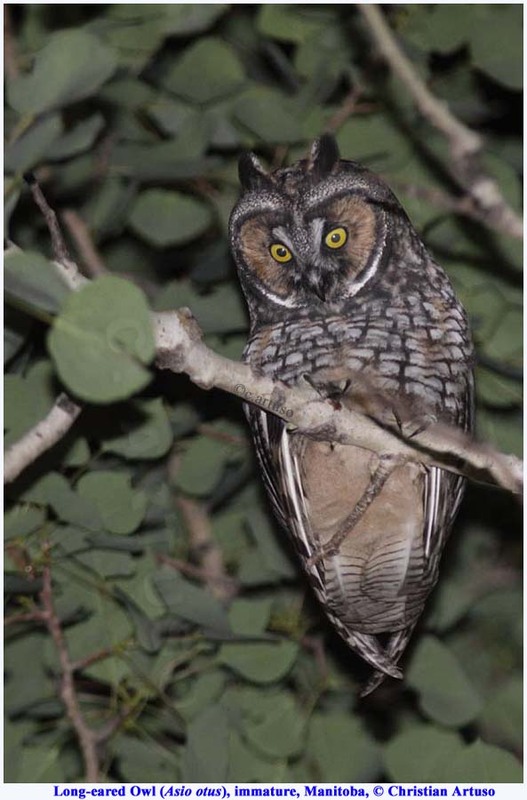 When the owls were still in Zone 2, in the night they went to Zone 3 some of the time. Here all three of them are. They began going to Zone 3 a lot more, but often roosted in Zone 2. Then they began quickly changing color, in the matter of a few days they were looking a bit orange, with splotches of black. A week later, they looked more like an adult, and could fly quite well. 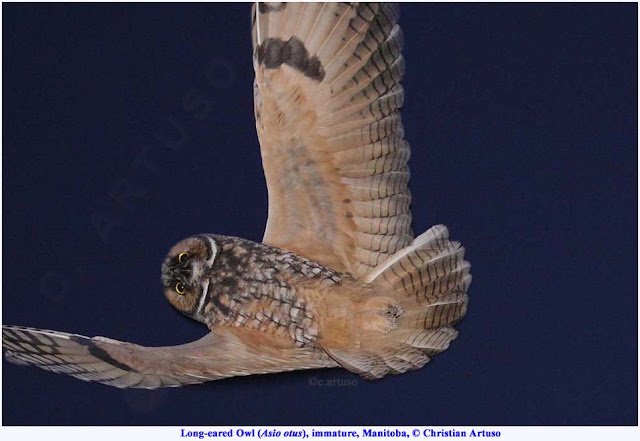 In another week or two, Christian came over to photograph the owls, and to help us with night observations. We started in the evening, and went into the night, so we got some daytime pictures, and a few night pictures. By this time they looked almost exactly like adults. The only flight shot we got. They looked like adults, and in the night they were flying all over, very quickly. They were still begging, last I saw them, which was late in July, just before we left to the Whiteshell for camping. 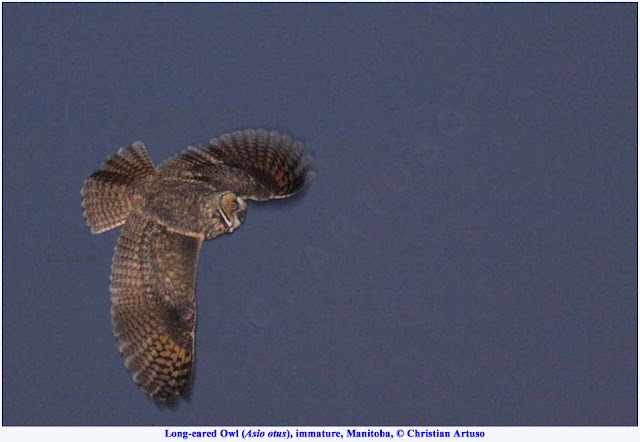 The young owls were such a treat, and a very special thing I will remember for a very, very long time. 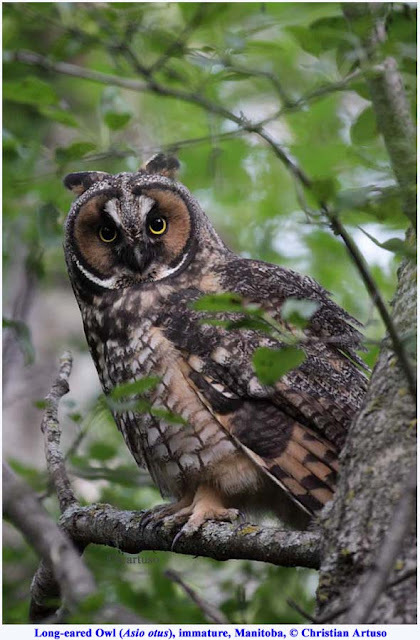 In all, we had Long-eared Owls right in our backyard for 5 months this year, a really spectacular thing. Watching them grow up, learn to fly, it was truly incredible. Can you guess this weeks birds? Last weeks was a Common Eider and her babies. On the 14th when we were driving on the Chief Peguis Trail Highway, when across a pond I saw many Cormorants in a tree. Wanting to get some pictures of them we came back later that day, from around the back of the pond. We talked to a nice lady, and she said the cormorants were there every day. We went to take pictures of the cormorants, and while I was taking photos something flew out from a tree. A heron! I got a picture of it flying, and I was quite sure it was a Black-crowned Night Heron, a lifer, and a considerably uncommon bird. It flew again and I got some better flight shots. It then sat in a tree and we were able to get lots of pictures. We went back the next day to get some more photos, and they were even better than the previous day. Today my brothers and I biked 37 km, and while we were biking we stopped in to try and see the Night Heron again. We didn't see it, but we saw the cormorants, and a Great Blue Heron. A friendly cat followed us around while we were photographing. And on our way out a Ring-billed Gull. It was quite the find for me, and I got some very nice photos of the Black-crowned Night Heron and the cormorants.